Having a horse do what you want depends on how close you are – both emotionally and physically. When your horse is in his or her paddock, whether adult or immature, your ability to exert operant control is out the window. You can’t reinforce quickly (you have three seconds), you certainly can’t reinforce immediately, and you will find it very difficult to use pressure / release, because when you pressure, the horse will just leave and then all of a sudden you are chasing him. Now you can chase a horse, and sometimes you have to – and when you do, there are some tips below. But you really don’t want to be in a chase. So, let’s think about getting a better start. 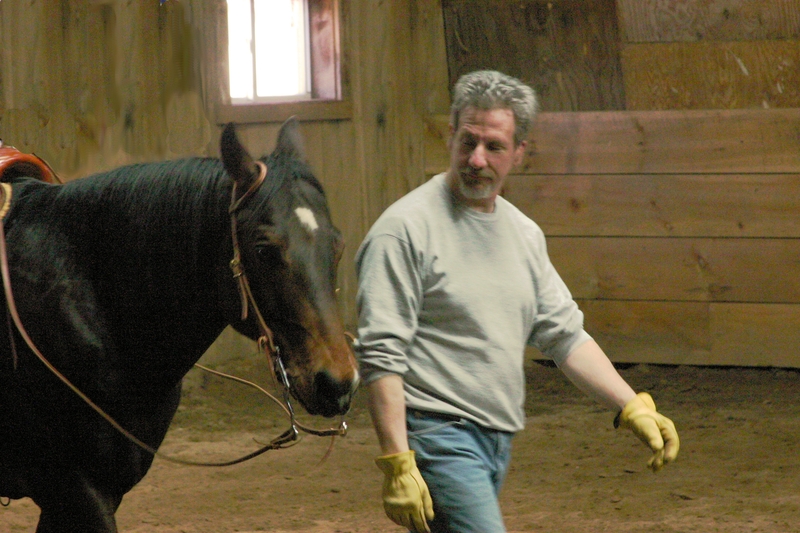 One of the most common issues here is getting the horse to come to you and allowing you to lead him. You’ll notice I didn’t say “catching him”. That’s on purpose. I never want to catch a horse. I want him to catch me. So I think about why I Iike to be with my friends and why they might like to be with me. Then I behave that way with the horse. I try to be nice to be with. I try to make it worth coming to me. I try to make it less enjoyable to leave me. If your horse has a favorite treat, bring a few with you to the paddock. Break them up so they are small and not completely satisfying but still nice – you don’t want him going “oh, I’m full” or “oh, that’s all I wanted”. The first time, enter the gate, stop, show him the treat and wait. If he comes toward you at all but stops, go to him, feed him the treat, pet him all over then go back to the gate, If you are lucky and he follows you to the gate right then, reward him with a treat, pet him for a while and then go. After the first time, go out some distance you think it’s likely the horse will go, offer the treat and don’t go closer until or unless he comes. Be patient and wait, wait wait. If he comes to you, reward him. If not, when you can’t wait any more, leave. Once he comes to you at a certain distance, next time, increase the distance. The first few times he comes all the way to you, do not halter him. Why? Because if he finds the halter aversive, you’ll wreck the work you’ve done. Once he’ll come all the way to you, start to walk away, reward him if he follows with a treat. You’d love him to walk around in the paddock with you and listen to your body language rather than the lead rope, but it doesn’t always work for horses who have trouble being led. You also need to learn how fast you can walk before he disengages and how far away you can get before he disengages. This will be different every day. Once you learn all this, he will go with you, and all the rest gets easier. When your horse is willing to come to you and potentially let you halter him, you don’t have to put the halter on his face right away, especially if he’s worried about the halter or has a hard time putting his face in it – just slip it over his head onto his neck. In either case, if he gets upset, remember – you can’t take it off until he calms down or you will be telling him you want him to react that way, when what you want to do is reward him for being calm. Just let him do what he needs to, don’t let go, don’t give in – he has to stop acting up before you can give him a treat or a pet. You can lead a horse around with the halter on the neck position. I did this once rescuing an excited horse next to a road. Once I got to a safe place, I put it on properly, but it was more important to lead him than to have everything right. Once you can properly halter him, you can start to transition to intermittent reinforcement and not always bring a treat. If you’ve been scratching him on the shoulder in front of the withers already, that’s the best substitute reward. You can also start to work on his following you in the arena, by first using light and then no lead rope tension, and then when you have confidence, tossing the lead rope over his withers and having him follow you. It’s also a good idea to do this at the end of a riding session so you continue to keep alive the idea that he should be able to follow you with no rope. Keep in mind that this is definitely a secondary thing you want to train into him. It’s a great capability to have when you want to pick him up, and it’s helpful when something goes wrong (like a bridle falling apart – which happened to me once), but the vast majority of the time you want the horse to only listen to the lead rope. So train him that when the lead rope is in your hand or over his shoulders, he can follow, but if the lead rope is on the ground, he should stand. With all this being great for the long term or the normal circumstance, what do you do when you need that horse NOW? And how about if he isn’t that good about coming to you or he’s too upset to behave normally. Pursuing a horse can do damage to his training and your relationship with him, but sometimes you just have to do it. If you do need to chase him down, he’ll zig and zag and try to see if you disappear. You have to follow him move for move. When he goes right, step so you are visible from the right eye. When he goes left, step so you are visible from the left eye. Don’t run, just stay with him. This makes you seem inescapable and in most cases the horse will capitulate after four or five zig zags. It’s tempting in a sequence like this to drive the horse into a corner with the idea of “trapping” him. This isn’t a good idea for handling a prey animal – his stress will go through the roof and he’ll just try to burst past you. Keep him in the open, be inescapable, and when he capitulates,be soft, friendly, non-confrontational, and rewarding to be with – have a treat or offer pets. Take some time before you put on the halter, and after that, pet him, treat him, and take some time before you lead him somewhere. It’s all about patience. Take your time, be a friend to your horse and he’ll follow wherever you go – lead rope or not. If you’ve ever watched the sport of horse racing, you probably have noticed the frantic whipping of the horse’s hindquarters by a jockey in the home stretch. And maybe you wondered if it actually made horses go faster. There have been no studies of this until recently, and this recent study indicates it is ineffective. But that should be no surprise. Horses are great anticipators and the use of the whip is pretty much routine. If my reining horse can anticipate that crossing the center can lead to a request for lead change, then I am fairly sure a racehorse can anticipate that whipping is coming. But according to horse learning theory, we know that the effectiveness of an aid or cue is based on the release of pressure. In other words, the whip will only work if as soon as the desired result is attained the whipping ceases. If it does not, the horse becomes desensitized to the whipping as a performance cue – after all, nothing it does makes it go away. in fact, to some extent, it gets worse. Because whether the horse speeds up or not, the pace and intensity of whipping almost certainly increases. To the horse, this actually would tend to indicate that slowing down is desired – and we see this in comments from jockeys and trainers. If racehorse trainers really understood something other than physical training, they would separate the whip from the go faster cue. For instance, Lensman knows that if I click my tongue while he’s spinning or running, he speeds up. He does that because during training, “ask” was the click, “tell” was leg pressure, and, if ever needed, a touch of the spur would be “command”. A racehorse trained this way would only get a whip tap when it failed to speed up from the “ask” cue. The connection between cue and result being clear would very likely result in a horse who ran faster when cued. Why not try something more humane like this? I thought I was going to work on fitness with my horses – everyone needs to get strengthened after the winter and it was warm tonight – but I ended up working on telepathy. People who know me know I don’t believe in real telepathy, for a variety of reasons based in physics, biology and cognitive structure, but they also know I call Lensman my telepathic horse, because he listens so closely, sometimes too closely, to my body connecting him to my mind. 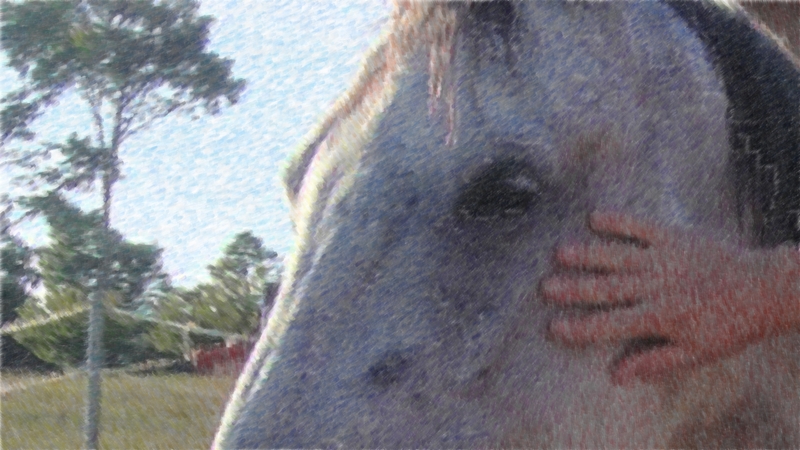 “Mindreading” as I use it, has to do with projecting what another creature, in this case the horse, is thinking. Being in their place. Hearing them. Horses don’t really do this like we do, their minds aren’t complex enough to model other minds. My horses don’t understand my internal state (am I sad, happy, whatever), they just listen to my body language and react to it. They happen to be very very good at it. Tonight it started with Gunsmoke. I was listening enough myself to feel him start to turn when I thought about turning. I was sure I hadn’t made any overt move, but there he went. I started trying it – thinking about turning in directions I usually don’t turn, to make sure it was this sort of telepathy. Breaking serpentines into ovals, going diagonal two thirds of the way up the arena. Doing a circle all of a sudden. But really, just thinking about it, hand and reins at the withers. And it was mostly working. Of course, he’s really hearing me through my seat and my legs and my weight distribution. As I think about what I’m about to do, it leaks into those limbs and my hips, and then the horse feels it. And it reminds me. “They can feel a mosquito land on their hairs, do you think they can’t feel your aids?” Even through the wood and leather of my Western reining saddle? “You can always be lighter,” Patrick had said to me once. Once again, I get something I know and it’s new again. The next level up, that much more subtle. Up at the trot, there’s more going on. I have more weight into my knees. The motion rocks and bounces more. There’s more noise around my signal. It’s harder to stay focused on being so totally quiet. But somehow I pull back to that same mental state I was in at the walk and… he responds again. Think hard, sit quiet, stay calm and focused – ride him like his mind. Be lighter. Stop, rest, see how good this is for him, how relaxed he is. Then off again at a walk, The bread in the wine tasting. Trot again. Then walk. Then stop and get ready to lope. But he’s too ready, he departs on telepathy, and this is the downside. Maybe I’m getting a little tired – lightness is exhausting. I let him go – he thinks I asked him and I won’t ruin that. Telepathy at the lope is harder. I start with departures. He’s a little more excited. After what we’ve been doing the extra postage stamp of force he needs to turn seems heavy. But he’s quiet. The lope comes down to slower and yet again – about as fast at the trot. I love it. It’s normally very hard to get him to be down at this quiet speed. So it’s a payoff for all the practice we just did. When this happens, it’s the best feeling in horsemanship. It’s exquisite horse under a rider having an exquisitely stable and focused session. I hope he feels as good about it as I do. I wonder how the aids feel to him when they are that soft. I feel glad I can do this sometimes and I feel I let him down when I can’t. But it’s good to have a high bar, and I pet him and thank him for being such a good boy.